The city of Downey has been host to one of aerospace history's most sacred sites. For more than six decades, men and women have gathered in this Los Angeles County town to make the dreams of tomorrow a reality—inventing the future and starting America's journey to the stars. A wealthy Los Angeles industrialist, E. M. Smith, began this history with the purchase of a portion of the Huynan Ranch in August 1929. His company, EMSCO Aircraft, was the first of what would become a memorable list of pioneers in aviation and space. The story of the site's aerospace history extends from North American Aviation's tenancy in 1947 to the site closure in 1999 when engineers and scientists designed and developed the aerospace technology that took man to the moon and established a permanent presence in space. Author Gerald A. Blackburn was an engineer and project manager with North American Aviation and the Boeing Company, spending 35 years at the Downey site. 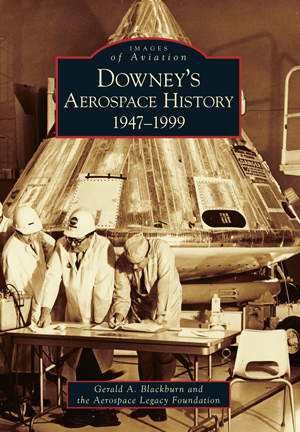 Here he tells the story of the unique heritage associated with this site and city through photographs and images from private and public archives, including the collection of Downey's Aerospace Legacy Foundation.